Now that Mother’s Day is a happy memory for 2016, it’s time to focus on the other most important person in your life – dad. After all he’s done to help shape you into the amazing person you’ve become, it’s time to celebrate him – and spoil him a little! As everyone knows, the way to dad’s heart is through his stomach. Show him you care with a menu that reflects his manly palette. Here’s the special menu Catering by Michaels will be serving up this Father’s Day! Whiskey, cherry liqueur, cherry syrup, sour cherry garnish. Seared tenderloin, truffle aïoli, caramelized onions, brioche bun. Cavatappi noodles, beer & cheddar cheese sauce, panko bread crumbs, parmesan cheese. Chocolate cremeux, salted peanut caramel, fresh whipped cream, chocolate shavings. Prepare to be refreshed. 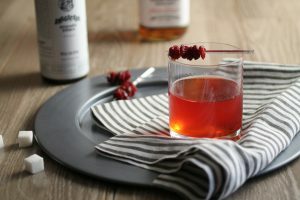 Our sour cherry old fashioned is a fresh, summery twist on an old favorite. Dad will love it, and we’re pretty sure you’ll enjoy it, too. If only all cocktails had this much attention to detail. 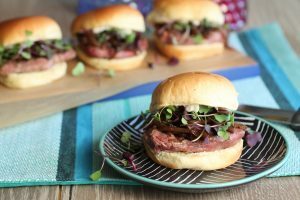 Try a new take on the burger. You might describe our tenderloin slider as “adorable” but we’re pretty sure that dad will just be thinking about how many he can eat before dessert. See if you can keep up! 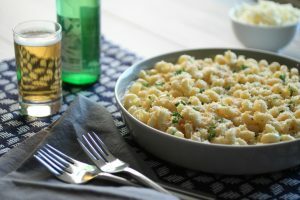 Nothing beats macaroni and cheese, so make sure to save at least a little bit of room for our beer & cheddar mac & cheese side. We promise it’s worth your stomach space, and the beer flavor gives it a little something extra (and ups it’s manly quotient for dad). If we could pick a favorite course, it would probably be this dessert. No matter how much you’ve already eaten, we’re pretty sure you can handle one or two (or more!) 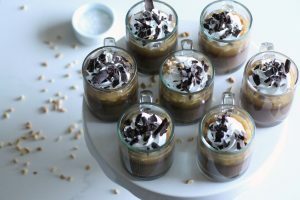 of these candy bar parfaits. They’re almost too easy to put down. Finally, let’s take a look at what dad and the rest of the family will be snacking on before the rest of the food comes out: our chipotle BBQ shrimp, wrapped in bacon. Nothing beats the perfect surf and turf combo, and this appetizer is it. We’re so excited about it that we decided to share the recipe so you can create it yourself – and enjoy it whenever you want! Combine shrimp with chipotle marinade and marinate in the refrigerator for at least 2 hours. Remove shrimp from refrigerator. Wrap each piece of shrimp with 1-1/4 slice of bacon. Skewer with a toothpick. Marinate for an additional 30 minutes. Remove shrimp from marinade. Place shrimp on a sheet tray lined with foil and sprayed with pan spray. Roast shrimp in 400 degree oven for 10-15 minutes or until bacon is crispy and shrimp is cooked through. In a food processor or blender, combine chipotle peppers, balsamic vinegar, Dijon mustard, honey, oil, salt and pepper. To all the dads out there – we hope you have a very happy Father’s Day, full of family fun and delicious eats. We’d love to hear what you think of our Father’s Day menu! What dish is your favorite? 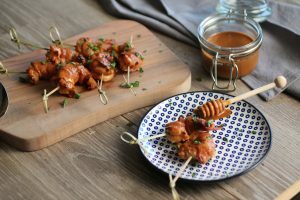 Will you be trying our chipotle bbq shrimp wrapped in bacon recipe? Let us know in the comments.